WATSONVILLE >> If algebra is the gateway to a career in mathematics, students at the 7th annual Bruce W. Woolpert Algebra Academy appeared hooked for life. 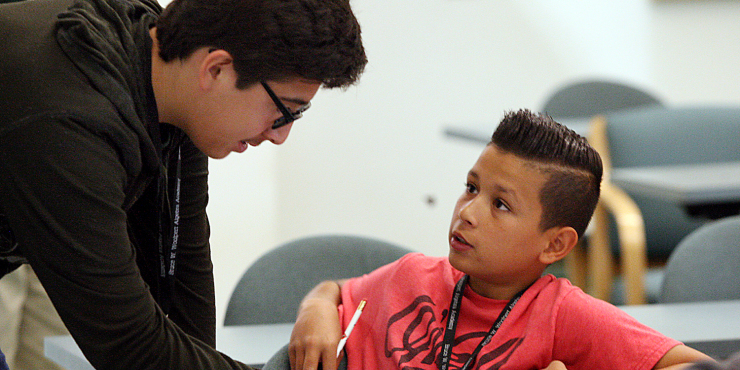 More than 100 of the incoming eighth-graders from Santa Cruz, San Benito and Monterey county middle schools attended this week’s algebra immersion camp at Granite Rock Co.’s corporate office in Watsonville. The academy, which focuses on providing a strong foundation in algebra, is taught by UC Santa Cruz and Cal State Monterey Bay professors — including Hongde Hu, chair of Cal State Monterey Bay’s mathematics and statistics department. Hu discovered a love for mathematics as an 11-year-old student in China’s Jiangxi Province. As an adult, math has propelled him around the world. After receiving his doctorate from McGill University in 1992, he became a sought-after Stanford University researcher, frequently presenting his work internationally. In 1999, Hu turned his attention to education, becoming a member of fledgling CSUMB’s faculty where he created both a minor and a major in the field. Yet students do not receive a solid foundation in algebra earlier enough in their academic careers, according to Hu. So when the late-Graniterock President and CEO Bruce Woolpert and corporate counsel Kevin Jeffrey invited Hu to collaborate on an algebra immersion program for middle school students seven years ago, he jumped at the chance. Today, the academy has launched numerous college careers; and for the first time this year, five academy graduates have returned to help with this summer’s program. Ullises Cervantes, 15, of Watsonville High graduated from the Algebra Academy three years ago and said the experience prepared him for eighth grade. Cervantes said he volunteered as a tutor at this year’s Algebra Academy because he wanted to give back. Cheylee Eaton, 13, of Aromas School, said she enjoys the fun aspects of the academy including the games and socializing. but her goal is serious. “I want to study math at Stanford,” she said.